Considering the fact that this 1933 movie was produced during the depression, when moviegoers expected pure entertainment, the results were exactly what they wanted. Glenda Farrell’s hard-boiled Florence Dempsey was what filmgoers were looking for. Please note that many of the movies of the period had male and female stars who were fast talkers and wise-crackers. Such stars as Cary Grant, Carole Lombard, Rosalind Russell, Bette Davis, James Cagney, Mae West, W. C. Fields, William Powell, Myrna Loy, etc. were the norm and not the exception. This wonderful movie was way ahead of its time. It’s two-color look was also something very different for the 1930s and its washed-out looked helped give it a more sinister appearance. 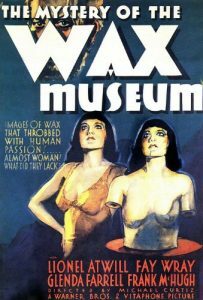 The later “House of Wax” used 3-D and having seen it in the movies I can tell you it was probably the best of the 3-D movies. Even better than “The Creature from the Black Lagoon”. Fay Wray was pure candy and she practiced her scream well for the upcoming “King Kong”. I have seen most of Lionel Atwill’s work and I believe the underplaying of Ivan Igor helped make him a more credible monster. The movie was well cast and one can not help but notice the uncanny fact that most of the actors in “The House of Wax” were chosen because they looked like the earlier actors except for the difference between Charles Buchinsky (Bronson) and Matthew Betz as the loyal mute assistant. Although enjoyable, “The House of Wax” was no match for the earlier edition. It’s understandable that “The House of Wax” did not use the characters of Florence Dempsey and Gavin Gordon. Sidekicks didn’t work as well as in the 50s.